Sticking to New Years Resolutions is usually the biggest obstacle people face. You manage to stay pretty disciplined for about a month and then life slowly takes over. Before you know it, you are already looking forward to breaking that bad habit next year. When it comes to choosing exercise as a New Years Resolution it is important to set goals. The reason we set goals is because it gives us something to work towards. We have all heard about the entrepreneur that writes himself a million dollar check with the hopes that one day he will cash it. Therefore, think about what you would like to achieve through that exercise routine, write it down, and then start building towards your goal. Ultimately, you would be much better off setting mini-goals along the way to avoid burning yourself out and preventing injury. For example, if your goal is to lose 30 pounds, aim to lose 1-2 pounds per week. If you want to participate in a marathon, gradually increase your running distance on a weekly basis until you have reached your desired amount. 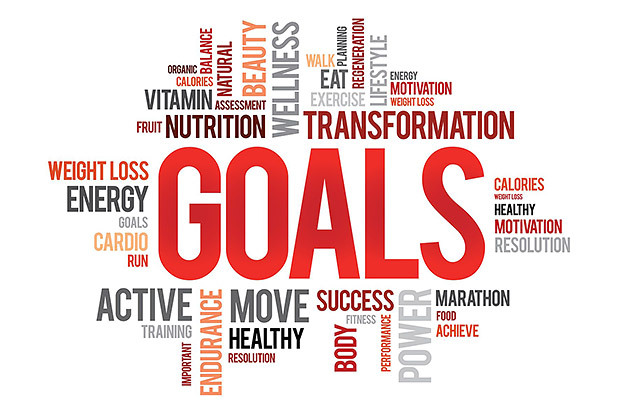 All to often people set unrealistic goals and end up abandoning their resolutions too soon. Temper your expectations and the results will come with consistency and a positive outlook. Hiring a personal trainer can also assist with helping you to achieve your goals. A personal trainer will be able to monitor your progress and at the right times increase the intensity of the workout. They can keep the workout interesting by changing the exercises and introducing you to new and innovating ways of working out. Lastly, a personal trainer will keep you accountable. Having an appointment scheduled will help you get to the gym on those days you otherwise wouldn’t go. In addition to a personal trainer, having a workout partner is another way to stay motivated. Working out with a familiar face can be comforting to those who are new to health clubs. Additionally, sticking to that diet will be much easier if the whole family is on board. Once you have stated your goals and your family is supportive, the quicker you can get rid of the shelves of potato chips and cookies. Now here comes the fun part. In addition to setting a long-term goal, think of a way you will reward yourself. For example, taking a family portrait or going on a shopping spree once you lost those 30 lbs. What about signing up for a marathon in a tropical destination? These are all great options to accompany your exercise goal. For more ideas on how to reward yourself check out the weekly newsletter.